The construction of the Rod Shippey Hall at the UC Hopland Research & Extension Center was not-at-all a "turn-key" effort. The contractor did a fantastic job with those phases of construction that fell under the contractual obligations. However, certain portions of the construction (like the audio-visual system) were totally up to HREC to plan and complete. Essentially all of the outside finish grading, parking lot, pathways, lighting, patio spaces, drainage system, and more have been or will be completed by HREC staff. 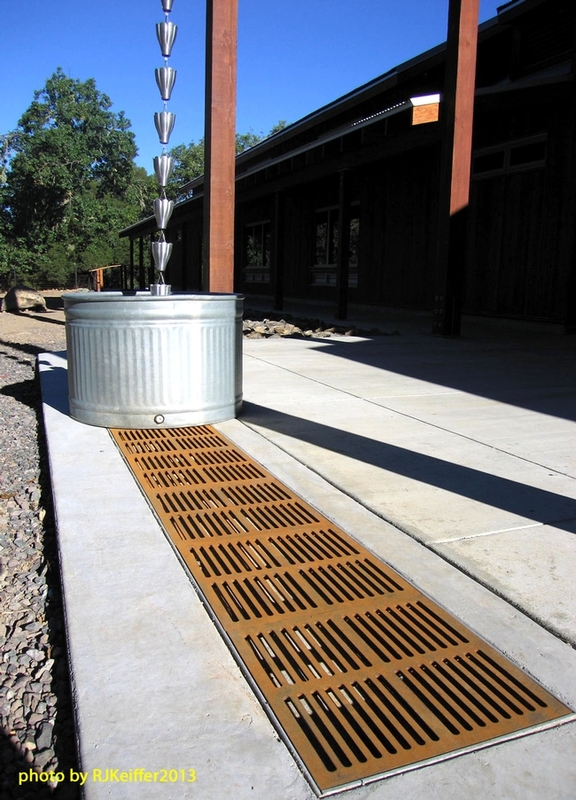 Here you see one of the two entrance cast iron GRATES that were just installed last week. They turned out GREAT! These grates help to collect winter-time water splash from the rain-cup-chains and also allow a place for visitors (like school group kids) to stomp their feet clean of sand and dirt before entering the building.